My husband and I were recently gifted a sourdough starter from a good friend of ours. There is not much better than freshly baked bread in my opinion, so we have had some fun experimenting with various flours and mix-ins. My husband is definitely the better bread-baker, as he has had some prior experience, but I'm watching and learning as he goes. Baking bread is such a science, from the exact proportions of ingredients to proofing time, but it's a great feeling to pull the final product out of the oven. We like the rustic shape and uniform crust it gets from baking in our beautiful Staub cast iron pans. This bread uses a mix of bread flour and whole wheat graham flour, which adds a nice whole grain touch, but keeps it from being too dense and hearty. 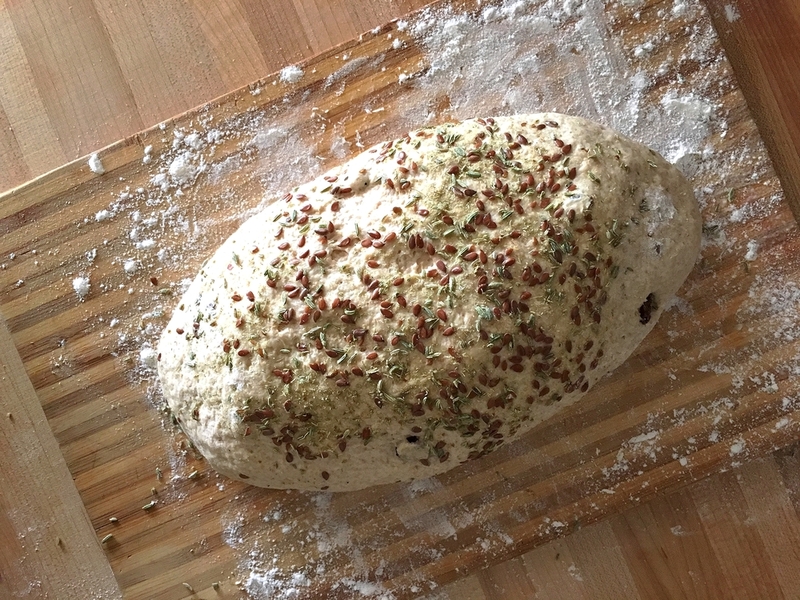 We mixed plump raisins in to the dough, and coated the top in fennel and flax seeds. If you want to make your own sourdough bread, but are unsure where to start, The Clever Carrot provides an in-depth, step-by-step tutorial that proved very helpful for us. To make the dough, combine the starter, water, olive oil and both flours in a bowl. Mix everything together by hand until just combined, and then set aside to rest for 30 minutes. Dissolve the salt in 1/2 tsp water, and fold it well into the dough mix. Re-form the dough into a rough ball. Cover your bowl with plastic wrap and a clean kitchen towel. Leave it in a warm spot to rise until it has doubled in size, which may take several hours. While the dough is fermenting, you may stretch and fold it over itself a few times to strengthen the dough, and in turn increase the total volume of the bread. Rotate the bowl ¼ turn and repeat this process until you have come full circle. Do every 30 minutes for 2 hours. To cut and shape the dough, lightly flour one half of a clean surface (counter top, pastry slab, cutting board), and leave the other half clean. Remove the dough from the bowl, and place onto the floured section so that it does not stick. To shape the dough, move it to the clean section of your surface. Fold the dough, side by side, over itself into the center. At this time, add the raisins so that they get fully incorporated. Flip the dough over and place it seam side down. Gently form your hands along the sides of the dough and rotate it until you are satisfied with its shape. Carefully coat the top of the bread with a mix of flax and fennel seeds. Coat the bottom of your Staub pan (or dutch oven) with cornmeal or flour. Place the dough inside for a second shorter rise, about 1-2 hours, or until it looks slightly puffy. Preheat your oven to 450F. Right before you're ready to bake your bread, make a shallow slash about 2 inches long in the center of the dough with a knife. Cover your dough with the lid, and place the pot into the oven. Bake for 20 minutes, then remove the lid, and continue to bake for an additional 25-30 minutes, until a nice golden brown crust has formed. Turn off the oven, crack open the oven door, and leave the bread . This allows the moisture to escape, leaving your bread with a crisp crust. If you prefer to take the internal temperature of your bread, it should read about 205F. Remove the bread from the oven, take it out of the pot, and allow it to cool for at least an hour before slicing. Now enjoy the results of all your hard work! *Adapted from Sourdough Bread by The Clever Carrot.